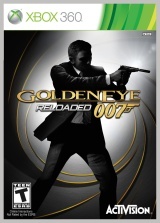 I am a great 007 fan and so really enjoy the games. When I came across this Goldeneye game trailer, I might have got quite excited! Lets face it the previous Goldeneye games didn’t follow the story-line what so ever – like lots of other James Bond games. But in this trailer I saw a decent amount from the film – it is my favourite James Bond but this could just be my imagination and it could be yet another 007 game completely different from the film. So there could be light at the end of the tunnel. If you saw Goldeneye released on the Wii last year, and its shocking graphics then this game should look like crystal for you. The MI6 ops mode looks particularly intriguing it has 4 different mode within it, you will need to use stealth, assault, elimination and defence. When I saw the multiplayer side I felt a little let down, the FPS and graphics didn’t look as good as in solo. You can play 8-16 player games and there are more maps and weapons than before! All in all I am greatly looking forward to this game being released on November 1st 2011 for America and the November 4th for Europe. I hope you are looking forward to it!